More than selling, more than beauty – the prime directive of advertising should be to clarify. Designers add huge value by simplifying; simplicity is the good manners of our age. My friend Alan recently pointed out that this ad is just jam packed with associations. 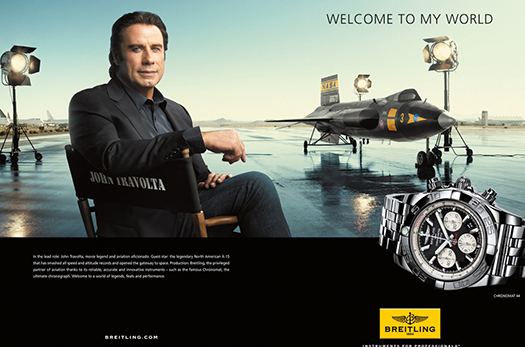 It starts with three brands: NASA, Travolta and Breitling. Travolta’s a real and accomplished pilot, and the X-15 is a real plane. But it’s a military antique, I don’t think anyone flies it, especially not civilians shooting an ad. And he’s not dressed for that. NASA’s brand is big in this ad, they love space and science. Travolta is a highly recognized member of the Church of Scientology, which Scientific American explains grew from a desire of pulp fiction writers to turn science fiction in to a tax exempt church. I wonder how NASA scientists feel about this non-intentional association. 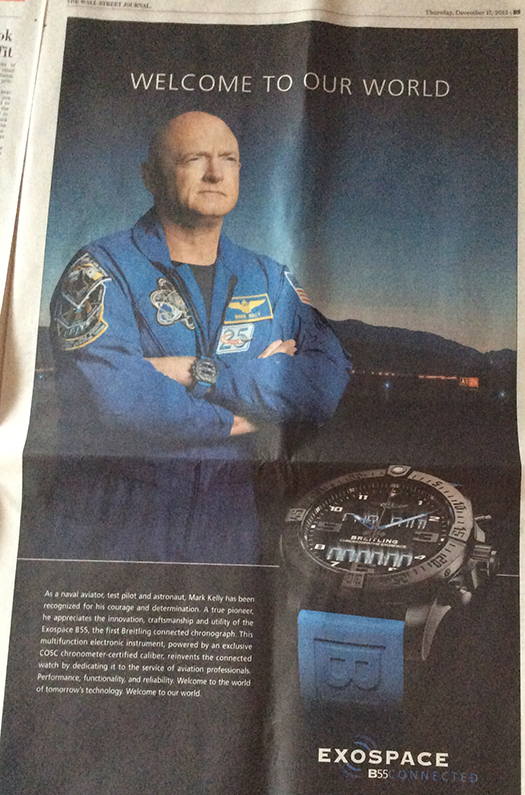 They don’t seem to have a direct deal with Breitling, but there is their name right in the ad. Who is this ad even selling to? Michael Jordan could sell anything: underwear, hot dogs – everyone wanted to “be like Mike”. I don’t think that’s what is happening here. Travotla isn’t selling based on his likability, or on being the “best ever” at his sport. Yet, I think he resonates with the older, also accomplished rich guys who tend buy watches like this. Travolta has had amazing success based on self-reinvention: Welcome Back Kotter, Grease, Saturday Night Fever, adventure films, playing Bill Clinton, Pulp Fiction. It’s not that the target audience wants to be him, or that he’s their favorite anything. But, they’ll grant that he’s a top of the economy survivor. The good people at Breitling want to establish their watch as the totem members of that group use to recognize each other. That’s what status symbols do. And love him or not, old guys have seen his staying power with their own eyes. If you’ve ever been to an FAO Schwarz toy store I apologize for any flashbacks that like might trigger of their “Welcome to Our World” theme which played endlessly there. That aside, one might ask, who is the plurality that owns the world our fancy watch will let us in on? Is it Breitling and Kelly, or Kelly and Travolta, or you dear reader and Kelly? Either way, I can’t imagine how the “our” could include us absent the watch, as by definition we’re already in our world, so being welcomed to it would seem needless. Wait, did “fancy watch” and “needless” just intersect – there’s a thought I can’t imagine the advertiser wanted. See what happens when ads are full of loose association and vague copy? Eventually, our brains will triangulate some meaning from these random acts of branding. How about “Brietling the totem for old guys who have a hard time saying Idina Menzel“. Yep, there you go Alan, I’m going with that. Is Obama the Anti-Christ? Just ask Google, CNN, or John McCain Online.